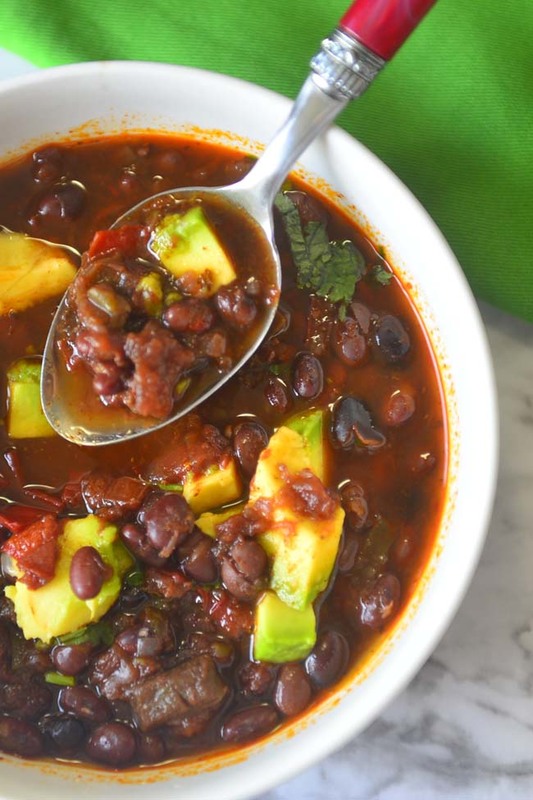 Here is a delicious pot of chili that screams weekday comfort ! 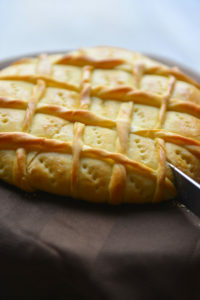 It is vegetarian (not to mention vegan) , gluten free and very satisfying. 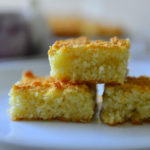 This made from scratch recipe is easier than you think and definitely much more flavorful than you would expect. I make this chili in my Instant Pot , but that is not the only way to do it. Make it on stove top in a dutch oven, in the slow cooker or the standard pressure cooker. With slight adjustments to the recipe, each of these versions will yield you delicious chili. Why Vegan , why not vegetarian or the good old meaty one ? Well this is the question I get asked often – especially by one of my own blood ! So you bet I have a good answer, and usually it goes like this ,“I like it this way”. Don’t get a wrong , I have other reasons – I like meat in moderation , and I am not a big fan of dairy. But the real reason is that this version is more delicious, and light, than any other ones I have tried . As many of you reading this can imagine this does not fly with every one in this household. So whenever I make these vegan, the toppings could be free for all. And yes , I do make the regular chili as well – some time you have to do what you have to just to keep the peace . In other words what I am trying to say is that I make vegan recipes not because I think that is ‘THE CORRECT WAY’ . I make it because I like these as much as or sometimes even better than the meat/vegetarian versions. This is the reason that you wont find vegan meat substitutes in my recipes. 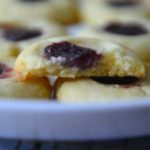 These are vegan because they are delicious as vegan ! I Love Black Beans ! All right , love might be a strong word here, but these black beauties always held a fascination to me. When I was little , as when I could count my age in my fingers , beans used to be part of the crop rotation in my grandparent’s place. There were long beans, black eyed peas, pole beans and many other varieties. Among them the black beans were prized. May be it was the stark contrast as you open the pods, may be it was the black juices they left behind or may be it had to do with the time spent sitting around the work tables and making mess peeling these. No matter what I liked about these beans then, the reason I like them now is that they are delicious ! 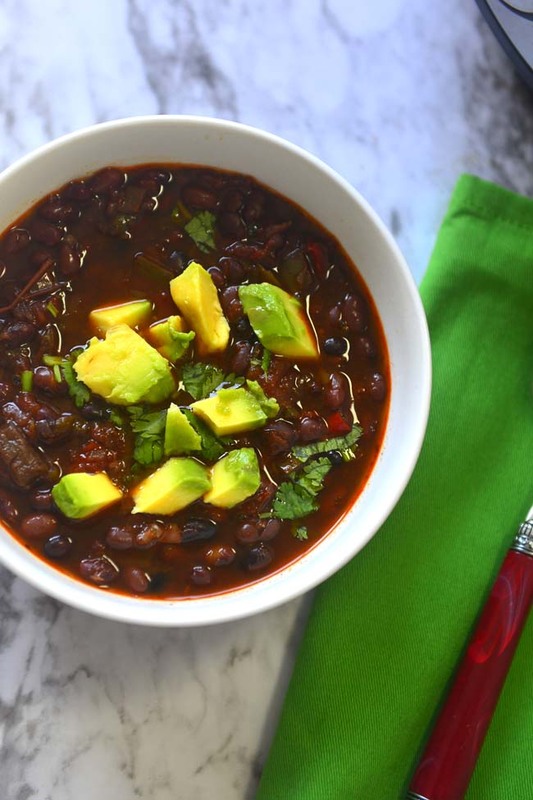 Black beans are very flavorful even when cooked with just a pinch of salt. And don’t discard the soaking liquid , that is if you soak the beans. If the beans do not agree with your gut may be you should look for another source of protein, because that black soaking liquid is not just colored water. Hidden in there are a ton of flavors . Well unless you are camping or backpacking. 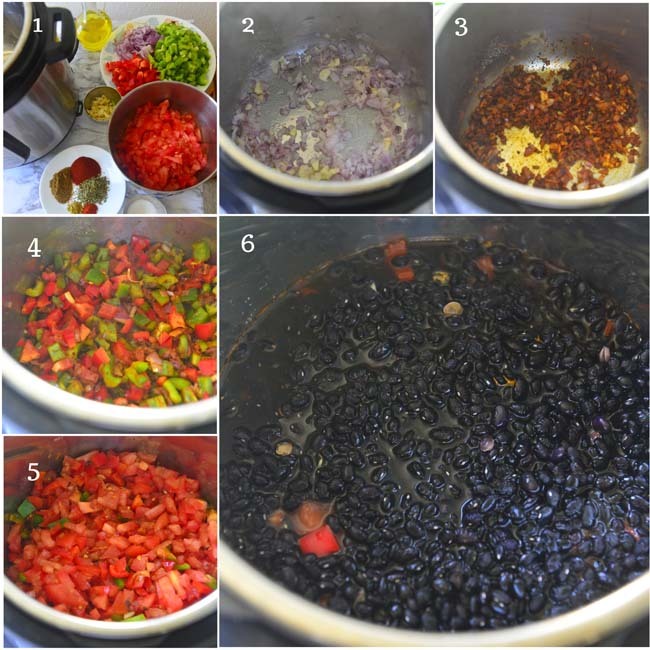 This black bean chili recipe does not use canned beans. I do not think there is any need for canned versions here. For one these beans do not need to be soaked especially if you are using slow cooker or any type of pressure cooker. Even on stove top , these just need extra 10 to 15 minutes of cooking time when not soaked. BTW the canned versions usually have higher percentage of sodium , not to mention synthetic or natural preservative. Do keep that in mind if adapting this recipe to use the canned products. That said we do camp and there are other times as well when canned food is the best option. 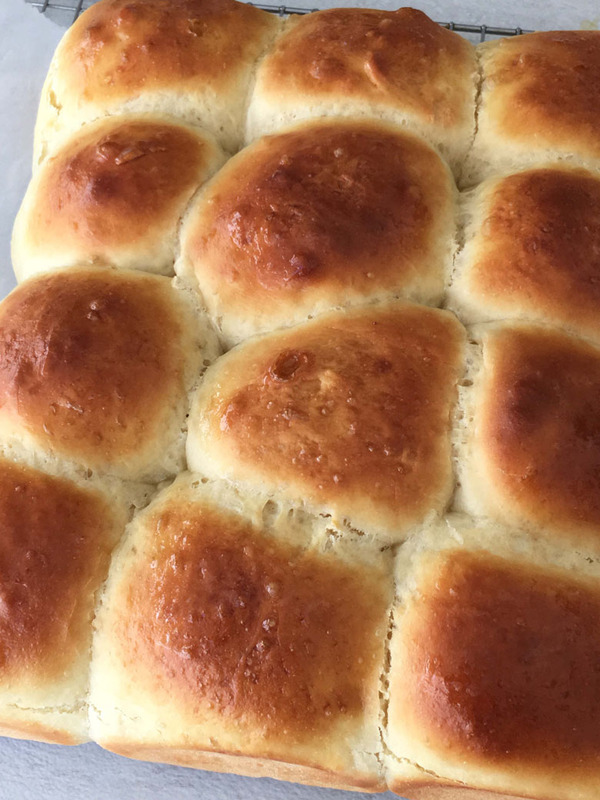 Scroll down and you will find the equivalents below the recipe. I do not use a packaged chili spice mix in this recipe, but you could if you have a favorite one. In that case use it instead of the dry spices. There is smoked paprika in the recipe here. It along with cumin gives the chili hearty, earthy and robust flavors. The other flavor are cayenne ,coca, and Mexican oregano. Sometimes, especially if I am out of cocoa, I add a pinch of coriander. Cayenne is added for the heat while the other flavors are what makes this chili. Two kinds of bell peppers – red and green – are used in this recipe. If you like it to be sweeter use more red peppers than green. The usual suspects – tomatoes and onions – are here as well. But that is all. Black bean is the star of this recipe not the vegetables. Serve these with your favorite toppings , be it sour cream (no judgement here), cheese , tortilla strips , onions, avocado , cilantro or whatever else you fancy. My favorite is creamy avocados – may be because it provides such a great textural and visual contrast. The chili is easy to make. Have all the ingredients ready to go and layer in the instant pot. It is this layering process that creates the incredible depth of flavors. But you could just add all the ingredients int the the instant pot and still get a pretty good chili . This is one of those dishes that improves as it rests. Plug in the slow cooker or instant pot while you wait for the guests and do the rest. Or make it and take along with you on a picnic. The instant pot and manual pressure cookers are very travel friendly. 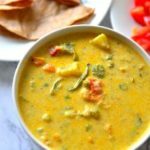 The recipe is created to be used in the instant pot. With just a few modifications it can be made in a regular pressure cooker , slow cooker or just on stove top. The instructions for all these are given below the recipe. Wash and pick through the black beans. Do not soak. Chop the onions fine. Core the peppers and chop into small pieces. Deseed the tomatoes and chop fine or coarsely blend in the blender. Mince the garlic. Press the sauté button on the Instant Pot. Sprinkle ½ tsp salt add the chopped garlic. Spices (including the cocoa) and stir. Finally add the chopped tomatoes and sauté for 1 to 2 minutes. Add the dried beans, and 3 C of water or vegetable stock. Close lid , set the vent to sealing. Use the Bean program or Manual high pressure for 40 minutes. Let the pressure release naturally (About 15 minutes after cooking cycle is complete). Open the lid , stir the chili , if there seems to be too much liquid set to sauté mode for 5 minutes. Stir and taste. If needed add salt and sugar to adjust the taste . Transfer to serving bowls , add toppings and enjoy ! Serve with your favorite toppings - Chopped Onions , Cilantro Avocado, Green Chilies, Lemon Wedges Tortilla Strips, Grated cheese, Sour Cream etc. If you are in a hurry substitute 3 15 oz cans of beans, 3 15-ounce cans diced tomatoes, with their juice. Add these to the sautéed bell pepper onion mix. And cook on low pressure for 15 minutes. Quick release pressure and serve. 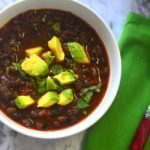 You could dump all the ingredients to the instant pot without the sautéing step and still make a delicious chili. Sautéing deepens the flavors and helps you create more complex tastes and textures. See blog for pressure cooker, slow cooker and stove top directions. The values are not accurate and should not be taken as a definitive guide. Actual values change depending on the cooking process and the products used. Pressure Cooker – If using the standard stove top pressure cooker , increase the liquids bay about ½ C. Other than that you wont have to make any changes. And yes , you have to be around to make sure that you turn the cooker off once the timer is done. 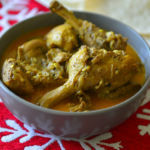 Slow Cooker – There is no change to the recipe. Use a skillet on stove top for the steps up to sautéing the vegetables and transfer everything to the slow cooker/ crock pot on a skillet. Set it to low for 8 to 10 hours. Stove top – Dutch oven chili is delicious , the only draw back is the amount of hands on time. 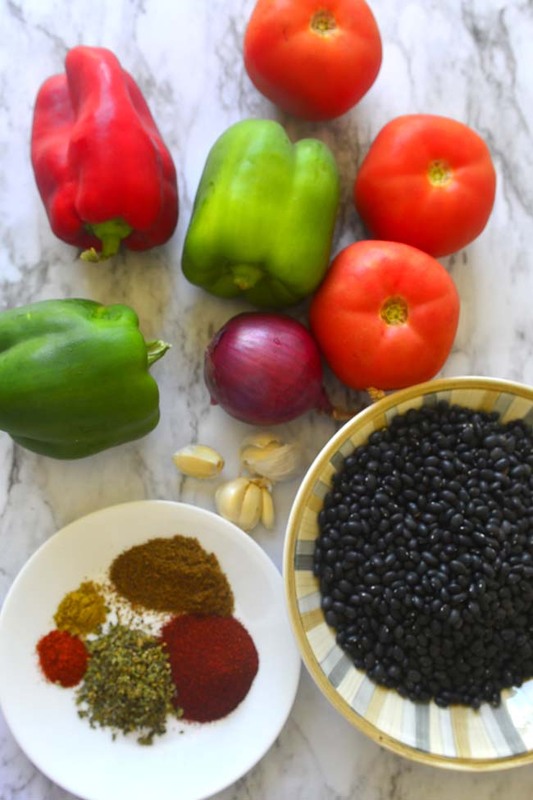 Black beans are easy to cook compared to kidney beans or garbanzo beans but it still does take time . Soaking the beans is helpful. Wash the beans well and soak in cooking water. Do not discard the soaking liquid. Other than that follow the recipe instructions and increase cooking liquid by 1 C per cup of beans , soak the beans, simmer for about 45 minute once the chili has come to a boil , and after about 20 minutes periodically check to ensure that there is enough liquid. Love your videos! 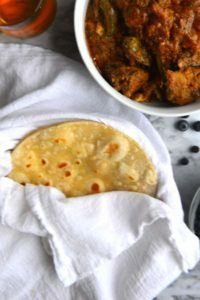 Id like to try making , but I dont have an Instant pot. I do have an electric pressure cooker and a rice cooker ( which I had before the instant pot came out, bummer!) do you think it cooker would work?